To honour Alan Turing, the clever people at LEGO have built a simple LEGO Turing Machine, to show everyone how simple a computer actually is. This is a great way to make every operation as visible as possible. 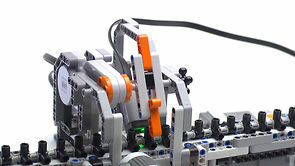 LEGO Turing Machine was made using the automatic components of just a single LEGO MINDSTORMS NXT set. According to Wikipedia: "A Turing machine is a device that manipulates symbols on a strip of tape according to a table of rules. Despite its simplicity, a Turing machine can be adapted to simulate the logic of any computer algorithm, and is particularly useful in explaining the functions of a CPU inside a computer." The Rocktime software developers are very impressed with the Turing machine language. If you require something a bit less complex but of great importance and bespoke for your business development, then please give us a call.